Let’s face it: the biggest challenge with finding the best coffee machines has more to do with having too many options rather than too few. In the United States, where the average coffee consumption is a little over three cups for a day and about half of the population drinks coffee regularly, it’s little surprise that competition is steep between different coffee machines. 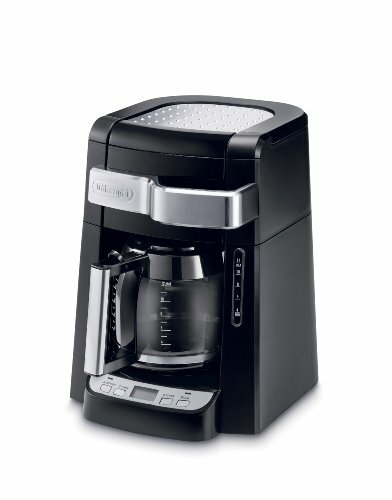 Delonghi is one of the bestselling companies competing for coffee lovers. Its coffee machines were projected to be among the biggest players in the market through 2020, according to a recent report. And there’s ample reason for Delonghi coffee machines being considered as among the best available for purchase. The small-appliance company is headquartered in Treviso, Italy and owns thirteen production facilities, as well as thirty international subsidiaries. Their coffee machines are sold in seventy-five countries worldwide, with international sales accounting for three-quarters of their revenue. While they also sell other appliances for the kitchen, such as air fryers and multi cookers, as well as other small home appliances, such as portable air conditioners, their largest variety is in their collection of different coffee machines. From automatic coffee machines to milk frothers and coffee grinders, Delonghi offers among the best and widest variety of machines to fill the needs of any coffee connoisseur. But which Delonghi coffee machines and small appliances are the best? To answer that question, we’ll be breaking down Delonghi coffee machines and appliances into distinct categories and suggesting a few different machines for each. Customer reviews: do customers overall seem satisfied with the product? Easy to use: can the product be operated even by someone who has never used a machine like it before? Versatility: this does not apply to everything, but is especially something to consider for general coffee machines. Can it be used for any additional purposes? As we mentioned, we’ll be selecting the best machines for different categories based upon product purpose. We will be focusing on a variety of coffee makers, from automatic to stovetop, but will also through in a few appliances you might need to complete your coffee brewing experience. Using the criteria above, we won’t be comparing coffee machines to other types of coffee machines (for instance, automatic coffee machines vs stovetop coffee makers). Instead, we’ll be selecting the best coffee machines and appliances within their own category. Espresso is a delightful, rich and dark drink when done right. Automatic espresso machines make it easier to achieve a great espresso without the level of precision required if you’re brewing it yourself. These machines are fully automatic, which means that, as opposed to semi automatic, where you’ll have to grind and tap the coffee, the machine pretty much does the work for you. Fully automatic espresso machines have a ‘one touch brewing system,’ which means that the machine itself will determine how much and how the water and coffee are brewed, and once you fill it, you just have to wait for your cup of espresso. As you can imagine, such machines are popular not only because the require less finesse to use, but also because it frees you up to do other things while your espresso is brewing. And unlike stovetop espresso makers, both semi and fully automatic espresso machines apply the optimal, or near the optimal suggested pressure level for espresso. (At least, the best machines do). 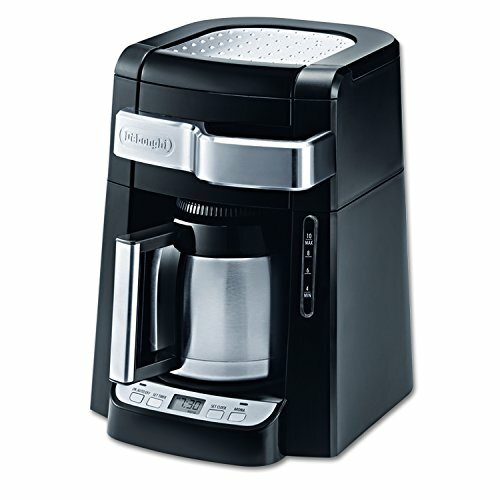 DeLonghi espresso machines are described as being compact in design, and easy to use. 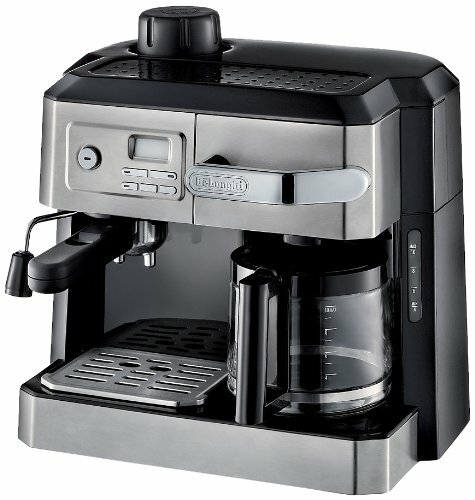 This espresso machine recieved an average of just under four and a half stars out of an impressive five hundred and seventy customer reviews. The compact size is said to harness the power of larger machines, but allow for more practical storage. 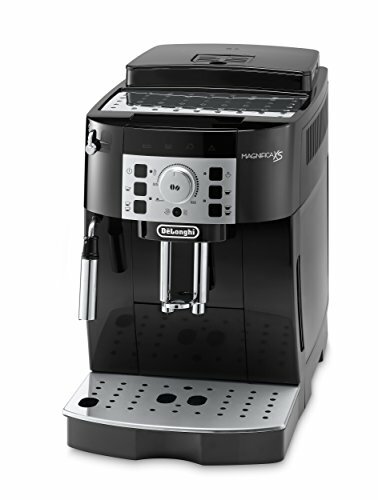 It features an additional milk frother for making your favorite espresso drinks An energy saving switcher and single boiler is more economical, and you can place both whole bean and ground coffee grinds for a great espresso. A direct-to-brew system grinds beans right before brewing for a fresher taste. Five settings allow you to choose the strength of your espresso, and you can select between four different serving sizes. 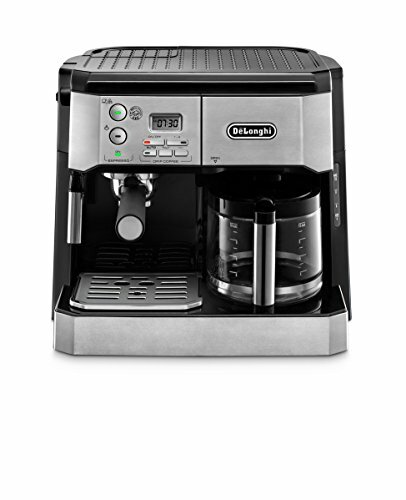 This is another one of the best-rated espresso machines from Delonghi and it also offers some of the best features. 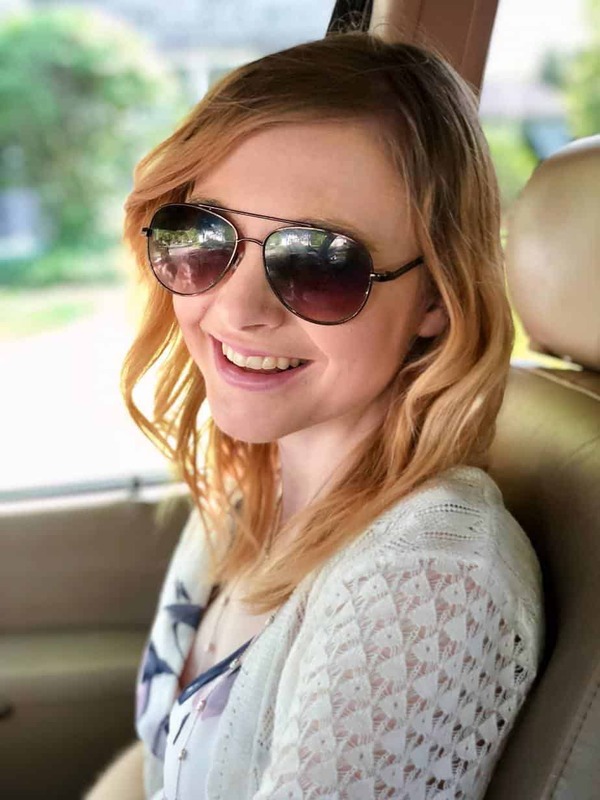 On Amazon, it received four out of five-star rating based on more than one thousand views. The focus here is on making espresso with quality froth (or crema). You can also make frothed milk with this machine. A Tubeless System is a slightly different method for a fresher grind, and like the other machine, it also can take both whole bean and ground coffee, and you can also select cup size. This is a more full-sized version, with a few less features but with the elegance and style of a professional machine a barista would use, and great for entertaining. Not as Worth It: The Prima Donna Machine may look elegant, but it’s not your best pick for an espresso machine from Delonghi. The price point is pretty high, and reviews are much more lukewarm. 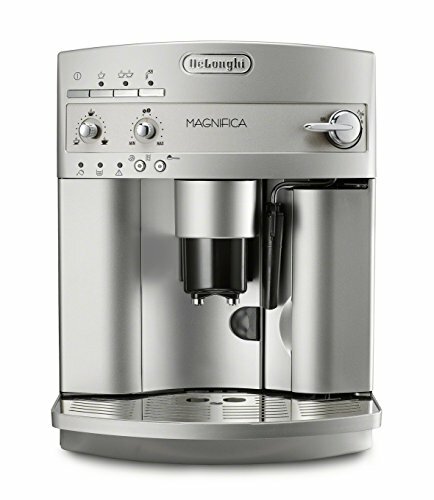 Plus, the Magnifica line just has enough features on offer that it doesn’t seem as much of a good value. The name says it all. These multipurpose machines are great for anyone who enjoys a wide range of coffee beverages but don’t want to have to purchase many separate machines. Delonghi all in one coffee machines can make coffee, espresso, and combine both steam and drip technology to create the beverage of your choice. These are bulkier and a bit less modern and sleek than other coffee machines, but they are powerful machines that literally allow you to make the coffee and espresso beverages of your choice. 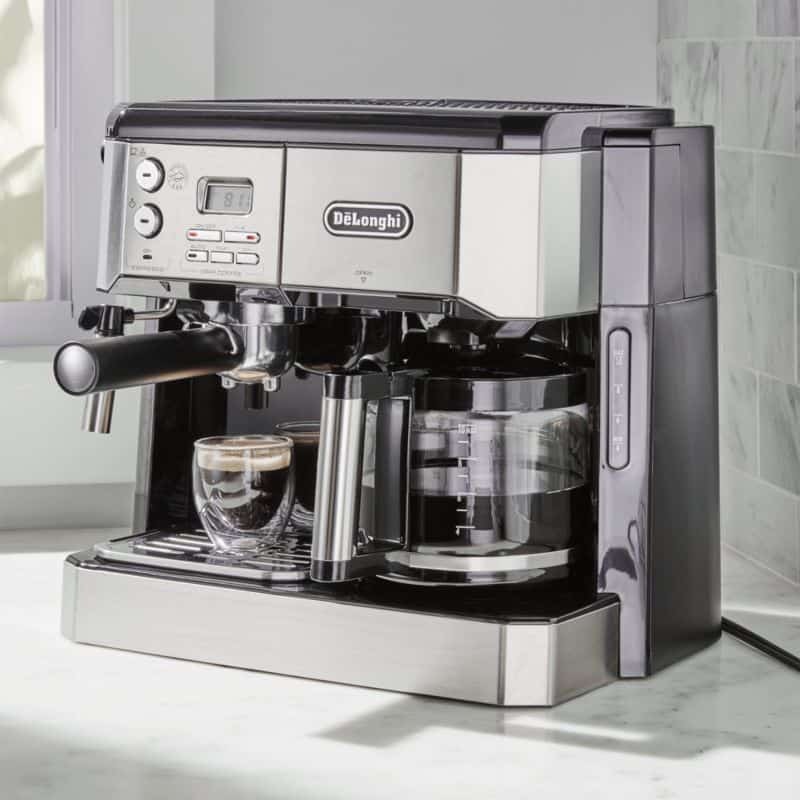 It’s hard to find all-in-one machines, and Delonghi gives you four different options. And they are all very affordable, with all of them under three hundred dollars and some under two hundred. In fact, while these coffee machines may not have all of the bells and whistles of the espresso machines, they might be one of your best bets if you’re looking for features with a low price point. Ratings for this all in one machine ranged from three to four stars on various sites. It’s considered an all in one cappuccino, espresso, and coffee machine, featuring drip coffee method, and with the ability to custom brew to preferred strength. An indicator, rather than advanced technology, helps tell you if your coffee is fresh. There’s also a cup tray and warmer that can keep drinks warm for up to two hours, making this a nice choice for a family of coffee drinkers. This is most budget friendly and simplest choice. While it doesn’t have the rave reviews of some other Delonghi machines, it gets the job done. If you want something under two hundred dollars that can brew both espresso and coffee, and a design that takes up less counter space, this might be a machine to at least consider. It also has the warming feature, so you have a convenient place to keep your coffee warm for up to two hours. Drip coffee is something you’ve most likely had, but may not be entirely sure what it means. Drip coffee is a brewing method, just like making an espresso requires a specialized brewing method. With drip coffee, you won’t get any crema, that frothy layer on top of espresso drinks that’s produced through high temperatures and pressure. Because there is no crema to produce, drip coffee is less precise and easier to customize. The aroma and flavor, though, of the coffee is especially important for drip coffee, since you won’t get the same rich result of espresso, which is usually more flavorful. Drip coffee is a slower brewing process, and at lower temperatures. Drip coffee is best for single origin but especially for flavored coffees, as the slow brewing process can help bring out those flavors. Since there are only two choices, both are the “best” picks for Delonghi coffee machines. This drip coffee maker has a ten cup capacity and a double wall, thermal carafe for a more durable holder for water. You can easily access both the coffee and water without removing any components, like you would for many other drip coffee makers. A special “aroma” button makes your brew more full bodied, no matter the coffee you use. A great feature is the 24 hour timer, which allows you to schedule coffee to be brewed at a certain time. There’s also a warm cup tray and a water level indicator for intuitive use. It does not state what kind of coffee can be used, so likely you would have to buy ground coffee or grind it yourself. Though these features are great, we must mention that some reviews held at below average, so you’ll want to check out customer complaints. Do keep in mind that drip coffee makers are simply not the same as high end coffee machines, and likely will never get as high of ratings. There isn’t much different in this model from Delonghi’s other drip coffee maker, except for the obviously larger cup capacity. You still have a front access system that allows you to reach coffee and water filters without taking anything out from the machine, and you can still time brewing sessions for a certain time of day, plus you also get the aroma button for a more full bodied brew. Strangely, this fared better in ratings, with a bit closer to average on the same review site, and a much more positive rating through Best Buy, where customers gave it an average of over four stars. It’s unclear why there’s a discrepancy, but maybe this is your best bet for a drip coffee machine from Delonghi–the cup size difference is fairly negligible, and the price isn’t too different either. Moka Pots are one of the most tried and true ways to brew coffee traditionally on a stove. While different tops of stovetop coffee makers exist, perhaps the most tested and respected of designs is the Moka Pot, first designed in Italy in the early 1930s by an inventor that thought to first incorporate the use of steam pressure and high temperatures to produce strong coffee. Moka pots are either powered by steam or they can now also be electronic. The best ones are made out of either aluminum or stainless steel, two durable metals not prone to corrosion. While Moka Pots use far lower pressure than an automatic espresso machine, they can produce fine quality coffee and also tend to be far less expensive. Moka pots are finicky when it comes to coffee grind. You need very fine, not course or whole bean coffee, to produce the best results. Moka pots won’t produce much of crema, but when used correctly, can be effective ways of making quality coffee. They also are far more compact and easy to take with you on your travels. Some use Moka pots for camping. Delonghi has just one option for a moka pot, and for a stovetop coffee maker in general. This moka pot is electric, unlike some of the more traditional versions, and features a transparent container and automatic safety shut off a system. A cool touch base, along with its compact size, makes it especially practical for traveling and camping. An aluminum boiler is meant for heavy and everyday use, and it automatically shuts off to prevent overheating. Coffee generally stays warm for about half an hour, and you’ll get three to six cups per brewing session. It’s well rated, with an average four out of five-star rating from over seven hundred Amazon reviews. Sixty dollars is not exceptionally cheap for a moka pot, but it is electric, highly rated, and still far cheaper than an automatic espresso machine or all in one maker. Manual espresso machines have fallen some in popularity, especially as automatic machines become more prevalent and popular. Still, there are reasons you might want a manual espresso machine over an automatic one. For one, they run cheaper, with some costing half the price of automatic machines. For another, while it takes more skill and knowledge to use, these machines allow you more say over the entire brewing and production process. Manual machines typically operate using pistons and pump levers, used to create the pressure needed to brew espresso. Because you control every part of the process, you could arguably produce a better tasting espresso than you would with an automated machine, but keep in mind that a manual machine is really best for those who truly are skilled and know how to brew coffee. 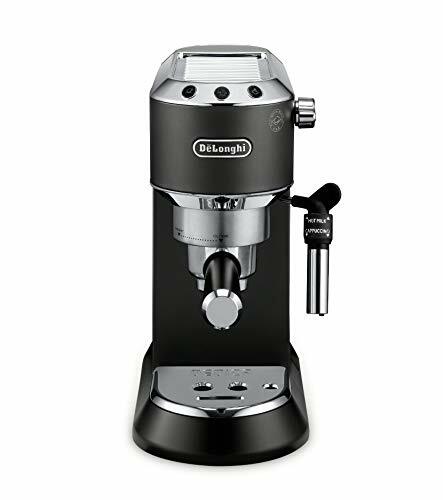 Of all coffee machine and coffee maker categories, Delonghi offers the most options in terms of manual espresso makers, making this company may be your best bet when it comes to finding the ever disappearing manual machine. The slick slim design also makes it a practical option even for the smallest of spaces. 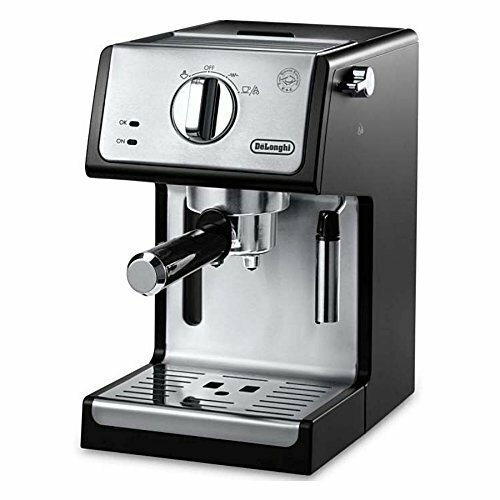 The best option for an espresso coffee manual machine from Delonghi is this model. 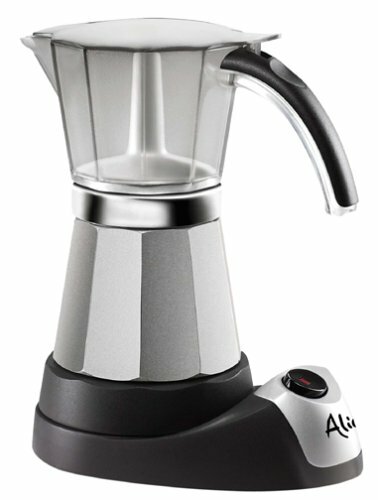 It’s a bit more traditional and elegant in design, and it allows you to make any espresso-based drink you can imagine. It comes equipped with a manual frother, plus a single and double shot espresso pump system. There’s a bit less information for its full features, but it’s marketed as easy to clean and comes with four and a half star ratings, beating out customer reviews on the Dedica DeLuxe. Previous Post: « Nespresso vs Keurig in 2019: Find Out Which is Best for You?